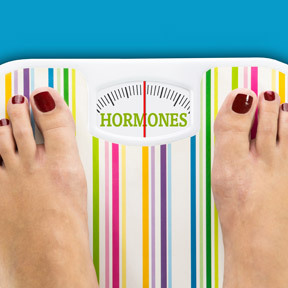 Do Hormones Make Us Gain Weight? Posted on March 31, 2017 | Comments Off on Do Hormones Make Us Gain Weight? In the 1950’s, only 10% of American adults were obese. Conversely, more than two out of three in the U.S. are overweight or obese, today. While it’s true that weight gain results from an energy imbalance, is there more behind the obesity epidemic than the simple math of calories in, calories out? Logically, calorie restriction is a good strategy for weight reduction. However dedicated one might be, caloric restriction appears unsustainable due to increased hunger and metabolic rate reduction, which promotes energy conservation and slows weight loss. Many who have struggled to lose weight and maintain weight loss will agree that dieting is a frustratingly long, arduous task that often results in a vicious cycle of weight loss and weight regain. While not all researchers agree, science points to the relationship between insulin and leptin as a major culprit behind fat storage and weight gain. Leptin, a powerful and influential appetite and energy regulating hormone, is produced in adipose tissue, or fat cells. Leptin suppresses appetite by signaling the brain when the body is satiated and ready to burn energy stores. When leptin is functioning properly, hunger is satisfied and the body feels energetic and ready to be physically active. The more adipose tissue we have, the more leptin we produce. It might seem that an overabundance of leptin would lead to less consumption. However, high levels of circulating leptin is a sign of leptin resistance, an indication that leptin is not working properly. There’s good reason why leptin is sometimes referred to as the “starvation” hormone. A major physiologic role of leptin is to respond to and defend against reductions of body fat that might impair survival and reproductive fitness. While we may have more than enough stored energy, when the brain does not recognize leptin, we are encouraged to overeat. At the same time, the body reduces energy expenditure, as it works diligently to maintain energy homeostasis. Why would the brain not recognize leptin? In a word, insulin! In response to our industrial, highly refined, high sugar, American diet, our bodies must increase insulin secretion to normalize blood sugar levels. High levels of insulin block leptin’s primary target receptors at the brain, tricking the brain into thinking we are starving. Insulin and leptin resistance appear to be front and center as core factors in our obesity crisis. The primary source of stored body fat is an excess refined carbohydrates, which are rapidly converted into glucose or blood sugar. With the aid of insulin, glucose enters the cells, where metabolic energy is produced. The industrial diet, high in refined sugars and carbohydrates, provides an abundance of glucose, resulting in chronically high insulin levels. With the aid of insulin, the “fat storage” hormone, the overabundance of glucose that is not burned for energy is stored in fat cells. Blood levels of leptin are positively correlated with body fat mass, suggesting that leptin plays a very important role in body fat regulation and fat deposition. With insulin and leptin resistance, our bodies are working against weight loss and weight loss maintenance. When the ability to transfer information to brain receptors is impaired, it supports an underlying desire to overeat, promotes further weight gain, and sets the stage for obesity and chronic diseases. It stands to reason that focusing on diet quality, rather than calorie quantity, would be an appropriate strategy for weight loss. Eliminating highly processed foods in favor of healthy fats, high fiber and protein-rich foods can help to reset our hunger hormone and insulin levels, eliminating cravings and the desire to overeat. When we adhere to a diet of healthy, whole, high fiber foods, insulin and leptin work in tandem as appetite regulators. The best way to re-establish normal leptin and insulin signaling is through proper diet. A healthy, whole food diet, devoid of sugar and highly refined carbohydrates, can enhance leptin and insulin sensitivity. Normalizing these hormone levels will support the brain’s response to hormone signaling. This allows the body to return to energy homeostasis and puts an end to unhealthy fat storage. Decreasing leptin and insulin levels naturally increases energy output, helps to stabilize weight maintenance and provides the incentive to be more physically active, which also plays an essential role in reducing insulin resistance. Fenugreek Plus® by Metagenics: This product supplies highly concentrated, clinically effective herbal support for healthy glucose metabolism. Gluten and dairy free, Non-GMO formulation. Cinnamon WS by Pure Encapsulations: This patented, concentrated, water soluble cinnamon extract is formulated to support healthy glucose metabolism. Gluten and soy free, Non-GMO vegetarian formulation. Advanced Bio-Curcumin® with Ginger Turmerones by Life Extension: ON SALE Formulated with highly absorbable BCM-95® Bio-Curcumin®, along with turmeric essential oil and ginger extracts, this product supports a healthy inflammatory response and proper pancreatic and digestive functions. If you are taking medications, are pregnant or lactating, or have a medical condition, consult your healthcare provider before taking this product. Pure Omega Ultra HP by Integrative Therapeutics: This highly concentrated fish oil provides sustainably sourced omega-3 essential fatty acids, along with antioxidant mixed tocopherols in support of overall health. Preserved with green tea leaf extract. Natural peppermint flavor. Gluten, soy and dairy free formulation. Regulation of energy balance by leptin. https://www.ncbi.nlm.nih.gov/pubmed/8886745. This entry was posted in Home and tagged Advanced Bio-Curcumin® with Ginger & Turmerones by Life Extension, Cinnamon WS by Pure Encapsulations, Do Hormones Make Us Gain Weight?, Fenugreek Plus® by Metagenics, Pure Omega Ultra HP by Integrative Therapeutics. Bookmark the permalink.